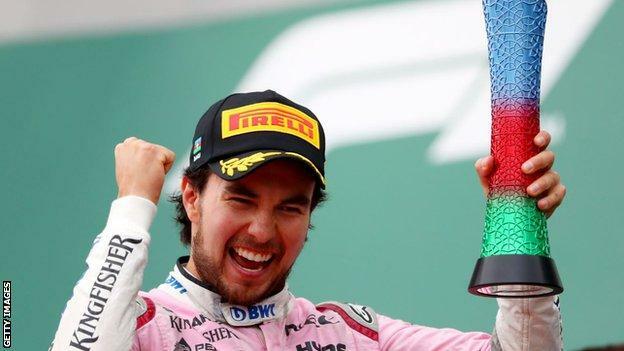 Sergio Perez will stay with Force India for the 2019 Formula 1 season. The 28-year-old Mexican has been with the team since 2014 and is seventh in the drivers’ championship with seven points finishes in the past nine races. Perez has been credited with fending off a winding-up petition against the team by starting administration proceedings earlier this year, saving all 405 jobs at their Silverstone base. “I’m very happy to finally announce my future,” said Perez. Perez’s team-mate next season is expected to be Williams’ Lance Stroll, son of Canadian billionaire Lawrence Stroll – the man who led the takeover of the team by a consortium in the summer. The administration proceedings were triggered by Perez – who was owed salary payments – as part of an agreement with management to save the team, which was in financial difficulties related to the legal problems of then-owner Vijay Mallya. In return, Perez was guaranteed a seat in 2019 at Force India, for whom his Mexican sponsorship backing is important. “The new investment the team is enjoying fills me with confidence and I’m really excited about the future,” said Perez, who came third in Azerbaijan in April and fifth in Belgium in August. 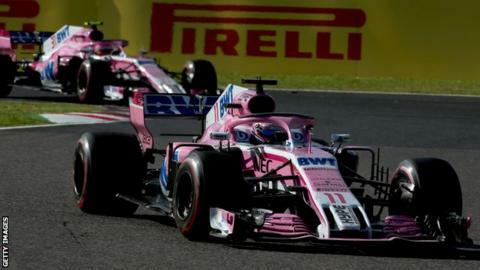 Frenchman Esteban Ocon, Perez’s current team-mate, is 11th in the drivers’ championship, four points behind Perez, but faces an uncertain future in the sport. The Mercedes-contracted driver could be without a seat in F1 next year, although he has been in talks with Williams, who are yet to confirm who will partner 20-year-old Briton George Russell.